In this figure, the arrow represents a beam of electrons moving in the plane of paper from left to right. How would the beam be deflected, relative to the paper, if (i) A is a north pole and B is a south pole? (ii) A is a positively charged plate and B is a negatively charged plate? (i) The beam will deflect outwards, perpendicular to the plane of paper (by Fleming's left hand rule) if A is the north pole and B is the south pole. 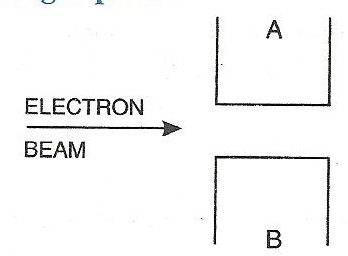 (ii) The beam will deflect upwards in the plane of paper (i.e., towards the positive plate) if A is the positively charged plate and B is the negatively charged plate.